This travel adapter Brazil transformer convert adapter us to Brazil. 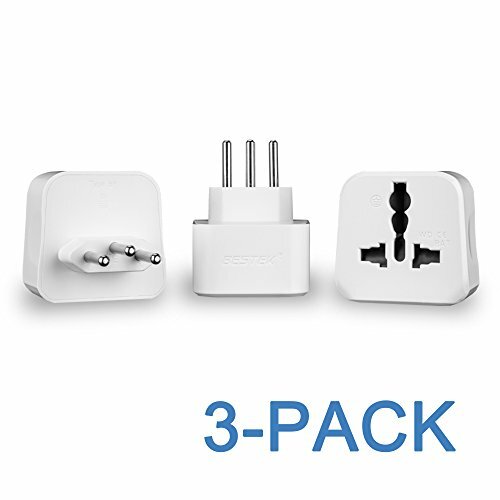 This Brazil travel adapter converter is compatible with all your 2 / 3 prong adapter of USA plug. This travel adapter/converter accepts any adapter plug from us, eu, uk, au and etc. except type D/M. certified safety material and portable design, our brazil power adapter is the best choise for you and your family. digital cameras, MP3 players, GPS, laptops etc. (Max 2500W devices)Notice: The power adapter for brazil is not a power converter. All BESTEK Products come with an 18-Month warranty and a lifetime of friendly customer support!